The first phase of The 400MW Cimarron Bend wind project came online in January 2017. Image: courtesy of Tradewind Energy, Inc. The 400MW Cimarron Bend wind project is located in Clark County, Kansas, US. Image: courtesy of Eric Pierce. The Cimarron Bend wind farm will power more than 149,000 households in the US. Image: courtesy of Enel Green Power S.p.A. The 400MW Cimarron Bend wind project is currently under construction in Clark County, Kansas, US. The project is being developed by Tradewind Energy for Enel Green Power North America (EGPNA), a part of the Enel Group. The wind farm will be owned by Cimarron Bend Wind Holdings, a subsidiary of EGPNA. It will generate approximately 1.8TWh of green electricity a year, which is enough to meet the energy consumption of more than 149,000 households in the US, when fully commissioned. The wind farm is expected to offset approximately 1.3 million tonnes (Mt) of CO2 emissions, 6,000t of NOx and 8,400t of SO2 a year. The phased development of the Cimarron Bend wind project involves construction of the wind farm in two phases of 200MW each. The project site extends over an area of more than 60,000 acres. The wind farm development will involve an investment of approximately $610m. Construction on the project began in April 2016 and the 200MW phase one became operational in January 2017. The project involves the installation of approximately 200 2MW wind turbine generators and construction of access roads and belowground collection lines, substations, and other related facilities including transmission line. The project will use local workforce and materials for the construction, boosting the local economy by generating more than 350 jobs during peak periods of construction and up to 12 full-time jobs during operations. The electricity generated by the Cimarron Bend is sold to Google and Kansas City Board of Public Utilities (BPU) under two, 200MW bundled, long-term power purchase agreements (PPAs). The project is Enel Group’s first North American wind farm to trade a portion of the electricity generated to a corporate off-taker. The PPA will help Google to reach its target of using 100% renewable energy for global operations in 2017. The Cimarron Bend wind farm is connected to the new ITC 345kV Clark County substation located north of the Cimarron Bend project site, through a 21.7km-long overhead transmission line. The substation is equipped with two 345kV reactors, a control centre, nine 345kV gas circuit breakers and 16 345kV unplug switches. It feeds the electricity into the transmission network within the Southwest Power Pool Balancing Authority Area (BAA). 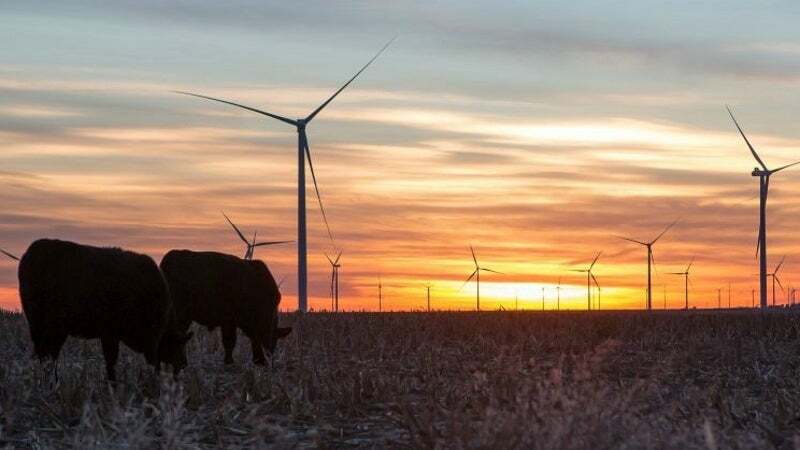 The project is also expected to be interconnected to a proposed Clean Line Energy DC transmission line, which is intended to transmit Kansas wind power to the east. "The project is Enel Group’s first North American wind farm to trade a portion of the electricity generated to a corporate off-taker." EGPNA, through its subsidiary Cimarron Bend Wind Holdings, signed a tax equity agreement with investors including Bank of America Merrill Lynch, J.P. Morgan and MetLife for the wind project in September 2016. Under the agreement, the investors will fund $500m for the project in exchange for 100% of Class B membership stakes in the wind farm. Enel Group will hold 100% of Class A interests. The first tranche of the funding was provided mid-way through the project construction, while the second instalment will be released upon completion of the project. Tradewind Energy has been preferred by Enel Group to develop the Cimarron Bend wind farm. Burns & McDonnell was contracted by Tradewind to perform wetland delineation and cultural resources surveys for the project.